Since I started using Outlook Express I have really missed the calendar and task function from the original full version of Outlook. 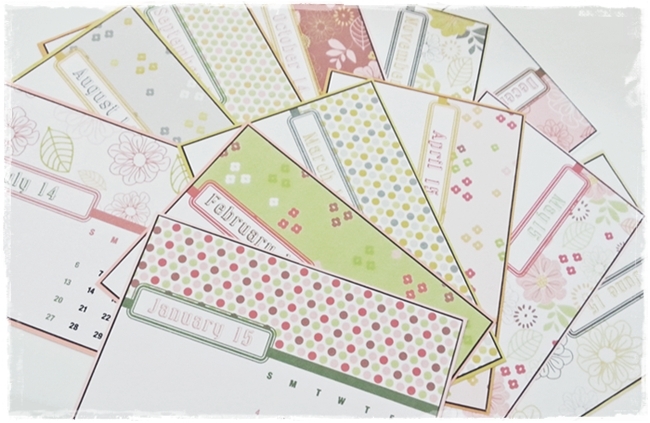 As a result I have been using a variety of desktop calendars, which are OK, but not great. So this weekend I decided to make myself a calendar for my desk to save having to constantly open calendars on my desktop, I wanted something that was there, unobtrusive but large enough to see easily. This has become even more relevant since starting the blog as I am constantly referring to dates and need a calendar for my planning and scheduling. So I thought I would share what I did this weekend and offer it to download and print to create your own. It runs from July 2014 to June 2015, in line with the Australian finanical year. 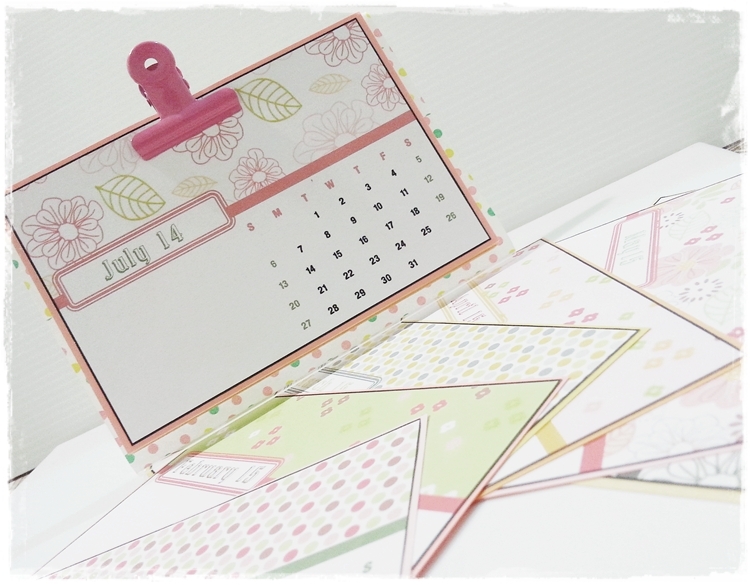 Originally I did plan to make a flip style calendar, but after seeing a pack of little coloured bulldog clips in a discount store I thought they were just too cute to pass up. And whilst it means a little more work having to shuffle the cards around rather than just flipping to the next month, on the positive side, it's so cute and, more importantly, I did not have to drill holes into my stand which means at any time, it can be turned back into a photo frame. 1 x 4 x 6 Inch (10cm x 15cm) slide photo frame. Print the calendars I created to share here or click on the image below, there are 4 months per page on an A4 page and each calendar is sized 14cm x 9.5cm so that they are just a little smaller than the frame. 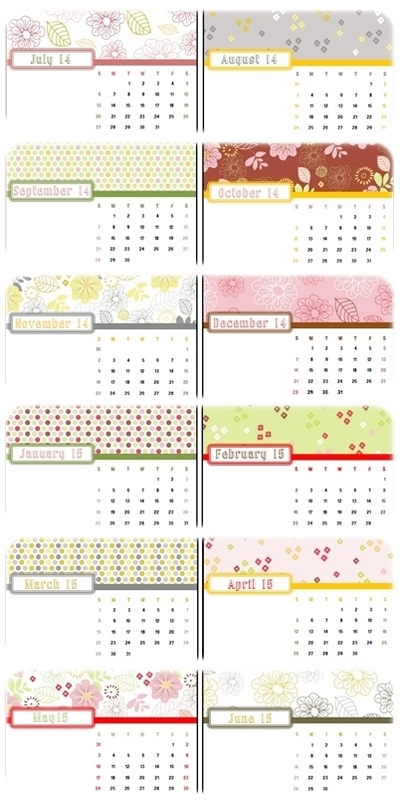 I cut the calendars out with an exacto knife, using double sided tape or glue, attach each month to cardstock (I used co-ordinating colours, but one single colours would work) or you could even skip this step and print your calendars directly onto cardstock or thicker paper. I covered my frame in dotty themed washi tape just to pretty it up a bit, although this is definitely not necessary as you really don't see much of the frame at all. 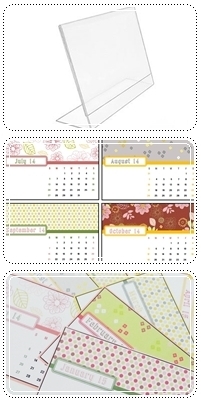 Using the bulldog clip, attached your calendar to the frame. I clipped all months together on the frame but you could clip one at a time if you had a smaller clip. 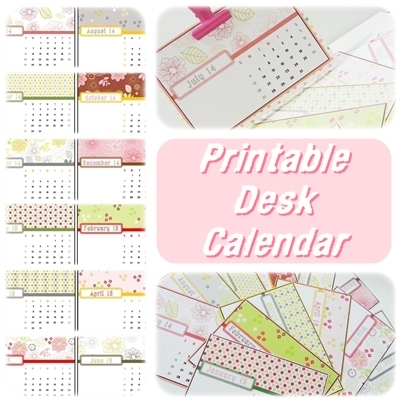 This looks so cute on my desk and now I don't have to go searching for calendars whenever I am working on my blog schedule, my budget or any other time I need to work out dates. Next time I think I will make a larger wall mounted version that includes the ability to writ onto the calendar so I can note birthdays, appointments and dates. But will leave that one for December.